Mardi Gras in Rio; an attack on all the senses, they say. I say, it is what you make it. It can be as crazy or as civilized as you wish, and with a little planning both approaches can be greatly enhanced. Our take on “Carnival” landed somewhere in the middle, leaning slightly more towards civilised! This stance wasn’t easy as our hostel turned out to be slap bang in the middle of Lapa, a serious Carnival party zone. Street parties (known as “blocos”) take place in every neighbourhood at any time, fancy dress and willingness to have fun being the only rules. This was my simple observation, however I suspect these blocos were result of much organisation and careful planning. Apparently during Carnival there are over 500 official blocos across the city and can attract anything from 10 to 150,000 partygoers, our favourite was the “Sergeant Pepper” bloco which played all Beatles songs to 100,000 revellers! 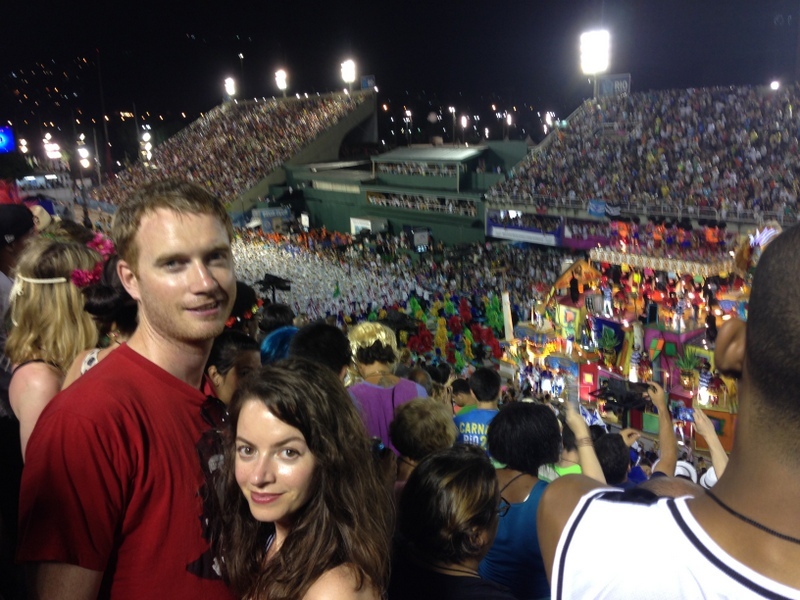 We had no idea of what to expect from Carnival in Rio and approached it bravely with open arms, it’s intensity knocked us sideways to start but we found our feet eventually and just went with it, can’t do anything else to be honest, except maybe go home and hide under the bed. 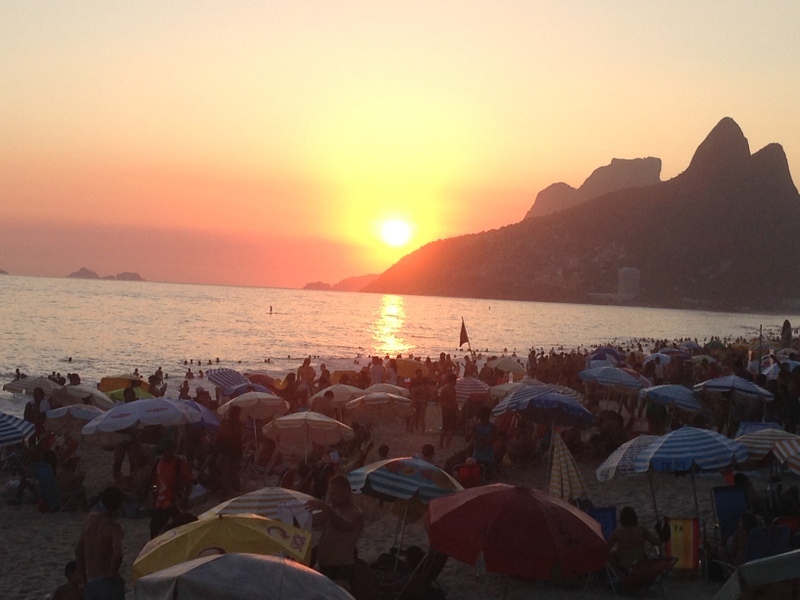 Copacabana Beach, it’s a bustling inferno of sun worshipers and hawkers, barely space to lay your towel and can’t hear yourself think… but who cares when you are in people watching paradise!? The only rule there seemed to be on Copacabana was that anything goes… in a thong. Who brought back the thong anyway!? I have to admit I saw a few amazing too-good-to-be-true-bums, unfortunately I saw many more thong clad bums that I simply wish I hadn’t. Usually I try not to judge, but I was one step away from holding up scorecards. 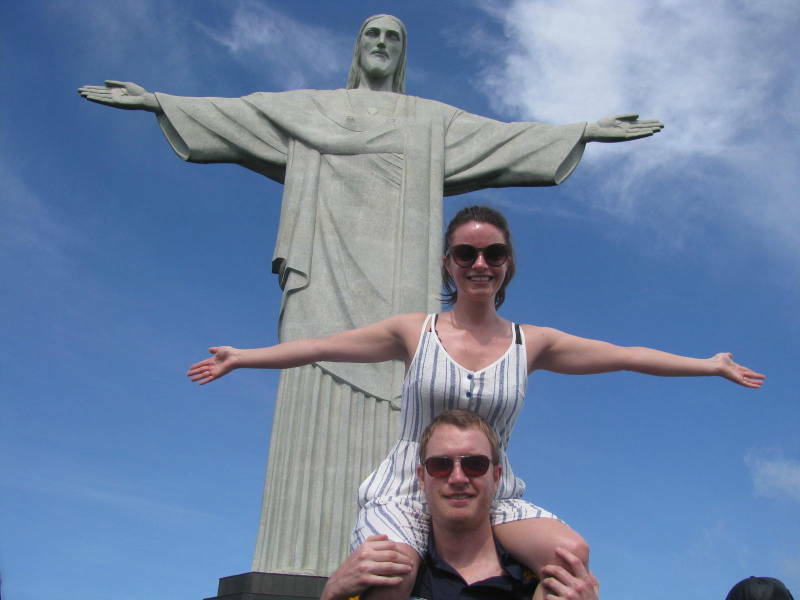 Following our beach experience, we opted for a city tour that ticked off all the main attractions in one go, starting with “Christ the Redeemer” or “Cristo Redentor” as he’s known in Rio. It’s probably the most iconic Rio landmark and I got a real buzz standing at his giant feet with my arms outstretched. The views of the city from Christ’s perch are just outstanding, a great photo backdrop if it weren’t for all the pesky tourists! 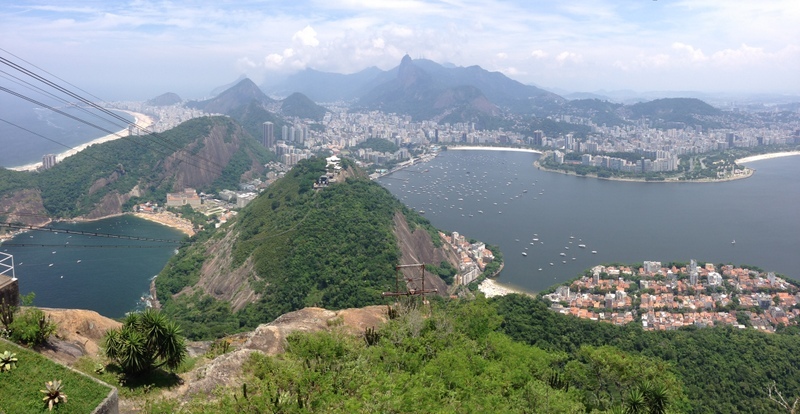 Sugarloaf Mountain offered equally breath-taking views of the city and the cable car to the summit beat the steps up to Christ the Redeemer. This was the cable car where James Bond almost met his demise when Jaws threatened to bite through the cables! Far removed from the glitzy world of Samba and Caprinhas are Rio’s favelas, shanty town communities where the city’s less fortunate call home. These over-crowded slums are home to 1.5m in Rio alone, where daily life is a struggle and the gun makes the law. We visited Rio’s largest favela with an ethical tour company where the money apparently goes directly to a community centre which helps kids that have trouble at home, or who just need somewhere safe to play. Watching the sun set on Ipanema Beach, we reflected on our time in this unforgettable city, the sunset was as spectacular as it was supposed to be, and the perfect “setting” for our last night in Rio de Janeiro. We followed the masses fleeing Carnival for some R&R on the rustic tropical island of Ilha Grande, a hop, skip and a jump from Rio… plus a bus and a boat ride of course. I think this time of year Ilha Grande is perhaps more of a detox destination than the Brazilian Ibiza, and it was filled to capacity with those looking for some fresh air and a lie down. Despite being so accessible from both Sao Paolo and Rio, the tiny island has managed to retain its rustic quality, the beaches are idyllic, there are no cars and it’s the kind of place where a shirt and shoes are not necessary for service. 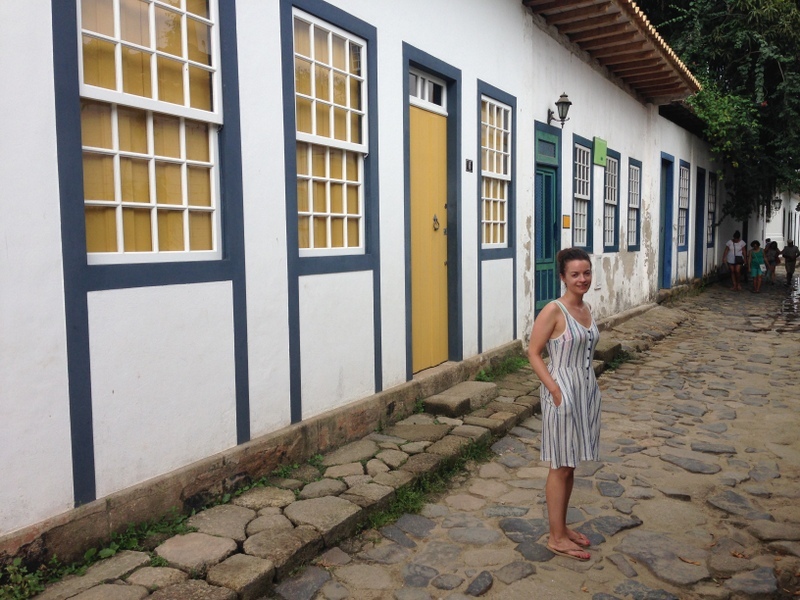 We moved onto the small colonial seaside town of Paraty with its pretty cobbled streets and whitewashed cottages, with a few days of sunshine it was perfect for a break by the pool to just chill out and gather our senses. The plan was to jump on a bus from Paraty to Iguazu Falls but we quickly learned that it’s necessary to go through Sao Paulo. On the advice of others, we had intentionally left Sao Paulo off our itinerary but really enjoyed our 24 hour stop over. Maybe it was just the neighbourhood we happened to stay in (Vila Madalena) but to us it had the feel of a quiet Notting Hill and worth a visit. Having recently visited Victoria Falls in Zambia/ Zimbabwe, we had high expectations and were not going to be bowled over by any old waterfall, we had already been spoiled, or so we thought! The falls straddle the Argentine/ Brazil border but are mostly located in Argentina. It’s most common for tourists to take the time to experience them from both countries. The local saying goes “Argentina has the falls but Brazil has the balcony” – they say in Brazil you get the specular panoramic views and in Argentina you get to experience being up close and personal. We opted for the Brazil side only and thought the “Devils Throat” was first class. It’s a walkway that takes you right out into the middle of the falls where you get completely soaked by its spray and an amazing 360-degree waterfall view. We felt no need to go to Argentina after that! Another activity exclusive to Foz do Iguacu is to visit the Itaipu Dam, the world’s largest hydroelectric power plant. It might not be at the top of your list of things to see in Brazil, but the sheer size of the construction and the achievement it represents is impressive. If I were to think of the opposite of Iguazu falls, it would be Itaipu Dam. The town of Foz do Iguaçu is the point where Brazil, Argentina and Paraguay meet so we took the opportunity to be able to say that we were in 3 countries in 1 day and quickly popped across to see the craziness of City del Este in Paraguay, famous for selling anything and everything at knock off prices. Although a visa is required for entry to Paraguay, at the “friendship” bridge border crossing its somehow optional! If you plan to exit Paraguay anywhere but the friendship bridge you are strongly advised to get the visa! We hung around for an hour or so, before heading back to Brazil to collect our backpacks and make our way to Argentina! I feel I have to mention the food in Brazil, I’m not sure if it was time of year or our limiting budget, but we didn’t think the cuisine was anything special and I would go as far as saying we didn’t have a single good meal in Brazil at all! Here’s a tip, don’t watch the bartender prepare your Caprinha, not because you’ll be shocked at the volume of alcohol going into it but you’ll be horrified at the amount of sugar being added! Just don’t look, enjoy your iconic Brazilian cocktail… and just make sure you brush your teeth before bed that night.